Tim Flannery. Atlantic Monthly Press, New York, 2001. 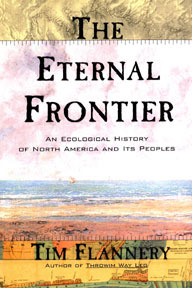 Subtitled An ecological history of North America and its peoples, this book sets itself a brave ambitious task — to tell the history of life in North America during the Cenozoic (that is, since the time of the dinosaurs). No small job, that, but Flannery more than achieves this goal. Actually, I rushed to buy The Eternal Frontier simply because I love other books by this author (There is another on this bookshelf, Throwim Way Leg, which is simply marvelous.). Flannery is a respected Australian mammalogist, a specialist on tree kangaroos. In this book he synthesizes a vast array of scientific information from ecologists, paleontologists, gelogists, zoologists, botanists, and other scientists, along with a broad selection of writing from historians and cultural commentators. No small task, this. Flannerys thesis could not be more American: that for 57 million years, since the first migrating Asian mammals walked into Canada, North America has been a perpetual frontier, invaded time and again by immigrant species. These waves of immigration have shaped North Americas ecology far more that its geology. Flannery makes this long evolutionary story come alive, not the dry stuff of bones and stones but a dynamic account, alive with vivid detail and obvious enthusiasm. The pages live with giant vampire bats, fast-running bears, enormous lions with paws the size of dinner plates — and, 13,000 years ago, a new kind of immigrant mammal, humans. This arrival of Clolvis humans is followed by the rapid extinction of most of North Americas megafauna (big animals). Flannerys statement is blunt: his black hole theory of extinction refers to the human gullets down which the animals disappeared forever. This process of invading, exploiting resources, and then moving on, the very essence of North Americas history, is our history too — only we have no other place to go, and we can only wonder what future visitor will come to replace us.